The group of plants treated in this lab, the sphenopsid and fern clades, is contained in the Euphyllophytina as defined by Kenrick and Crane (1997) in their cladistic treatment of early land plants. These are the first clades to diverge after the lycopsid-"everything else" split that must have occurred in the Silurian (based on the age of Baragwanathia). The fern and sphenopsid clades are sister to the seed plants within the euphyllophyte clade. Both ferns and sphenopsids have members in the living flora, although their modern diversities are vastly different. This should raise an eyebrow because this wasn't the case with most of the taxa we have considered previously, except of course the lycopsids. You should note, then, that as we study the Carboniferous flora we begin to see representatives of most major modern groups. Both the horsetails and the ferns are easily distinguished in the fossil record once they have become established. However, the early fossil record of these groups is marked by a number of taxa with dubious combinations of characters which could tie them to either group, depending on what importance you give to each character. It is therefore not surprising that the two clades come out as sisters in the latest phylogenetic analysis incorporating fossils (Kenrick & Crane 1997). This is also the reason why we treat them in a single lab. The sphenopsid and fern clades can be defined by the mesarch protoxylem confined to the outer lobed ends of the xylem bundles. You should be sure to make a detailed sketch for your notes of Equisetum and a living fern stele anatomy. The relationships between the clades are less clear. This is due to some controversy among paleobotanists as to what synapomorphies found in the earliest members of these clades should be used to define the clades. Most early ferns/sphenopsids look just like any other mid-Devonian plants (e.g., Pertica, which you will meet next week), and/or have a combination of features thought to be typical of both sphenopsids and ferns. It could well be that the traits we so far have used to group "equisitaleans" and "ferns" into monophyletic clades are the wrong ones (see discussion of sphenopsids and ferns below). At this point, it is not even clear that there are ANY useful apomorphies for these clades! Sphenophyllum (Figure 6.1) is a typical example of the controversy surrounding the basal members of the sphenopsid and fern clades, as its relationship to other members of the clade is far from resolved. It is generally regarded as a creeping or climbing plant that is locally abundant in Pennsylvanian overbank flood plain and lake deposits. It may also have been an understory shrub in the arborescent lycopsid forests of the same time period. Figure 6.1: Reconstruction of Sphenophyllum; note strobilus! The generic name Sphenophyllum originally included only impressions/compressions of certain leaves, but has come to include several types of leaves (Figure 6.2), stems and roots. 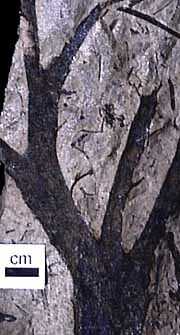 Compressions and permineralizations of Sphenophyllum show a node/internode arrangement with whorls of wedge-shaped leaves (VG 1:1). Are the leaves microphylls as in lycopsids or megaphylls? Stems are up to 2 cm in diameter and can display many orders of branching. Stem cross sections (VG 1:2) show that the primary xylem of the protostele is triarch. 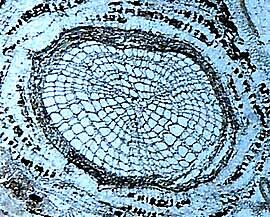 Xylem development is commonly exarch, although mesarch development has been described. 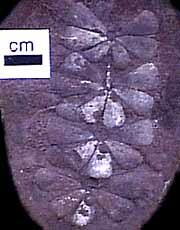 Secondary growth took place from a uni- or bifacial cambium, in a pattern that resembles that of many of the Carboniferous lycopsids(!). The reproductive parts of Sphenophyllum are organized in a loose strobilus, Bowmanites (same as Sphenophyllostachys) (VG 1:3). Bowmanites has sporangia attached to sporophylls on a stalk that curves back toward the strobilus axis. Conclusively, what features show resemblance to sphenopsids and ferns respectively? Or to something else, perhaps? Compare to what is written below about e.g. Ibyka. Figure 6.2: Variation in Sphenophyllum leaf shape. 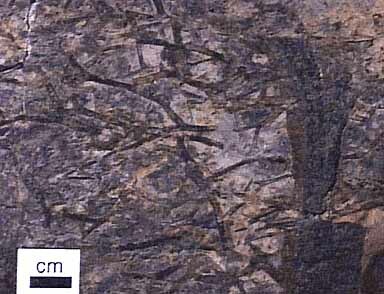 Hyenia and Calamophyton (VG 1:4)(VG 1:5) are other examples of enigmatic Devonian fossils with affinities to both sphenopsids and ferns. Take a minute and read the description of these two genera in Taylor & Taylor (1993). Hyenia and Calamophyton have been included in various groups with equivocal affinities to early ferns (e.g., Cladoxylales) or as "transitional" between the grade of plants formerly known as the Trimerophyta (included e.g., Pertica, Trimerophyton, Psilophyton) and later-appearing groups such as the sphenopsids, lycopsids or ferns. Clades originating from a grade, that is. Our best data now suggests that the lycopsids diverged early, even before the evolution of the trimerophyte grade plants. However, the relationship of these mid-Devonian genera to the fern and sphenopsid clades still remain controversial.